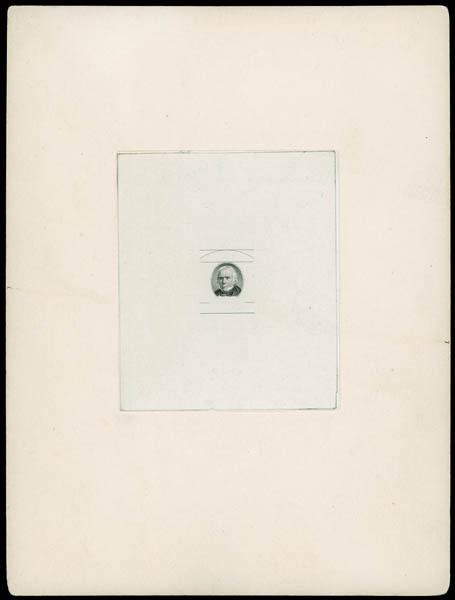 1903, 15¢ Henry Clay, portrait and initial framework progressive essay, on India die sunk on card (153x204mm, die size 75x88mm), incomplete engraving showing complete portrait and initial background lines, blue "66439" handstamp on reverse, bright and fresh, Very Fine and choice, an unrecorded essay, unlisted in the Scott catalog. Scott No. 309E Estimate $4,000 - 6,000. THE UNIQUE PROGRESSIVE ESSAY OF THE 1903 15¢ HENRY CLAY ISSUE. 1903, 50¢ orange, o.g., never hinged, perfectly centered amid beautifully balanced margins, rich vibrant color and fresh bright paper, Extremely Fine to Superb, with only five examples having received this grade with only three higher; with 2015 P.S.E. Graded certificate (XF-Sup 95, SMQ $9,000). A TRULY OUTSTANDING NEVER HINGED EXAMPLE OF THE 1902 50¢ DEFINITIVE ISSUE - ONE OF THE MOST DIFFICULT DENOMINATIONS OF THE ISSUE TO OBTAIN IN GEM NEVER HINGED CONDITION. 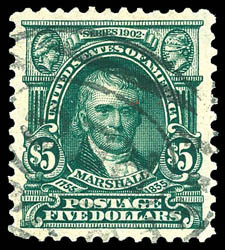 1903, $5 dark green, full o.g., well centered, rich bold color, bright and P.O. fresh, Very Fine to Extremely Fine, a beautiful mint Bureau high value; with 2015 P.F. Graded certificate (VF-XF 85, SSV $2,350). 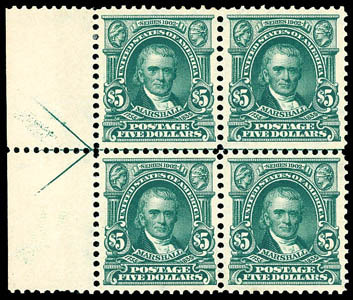 1903, $5 dark green, left margin arrow block of 4, o.g., hinged at top, never hinged at bottom, rich deep color, exceptional overall centering each within large margins, particularly fresh, Extremely Fine. Scott No. 313 $16,700 for singles. 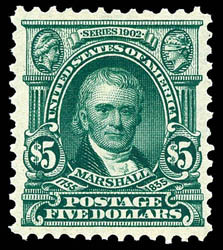 WITHOUT QUESTION, ONE OF THE FINEST MINT ARROW BLOCKS OF THE 1903 $5 MARSHALL HIGH VALUE OF THE FEW KNOWN. 1903, $5 dark green, neat registry oval cancel, exceptional centering amid large well balanced margins all around, intensely rich color enhancing a sharp proof-like impression, Extremely Fine to Superb, one of four used examples to grade as such with none higher; with 2010 P.S.E. Graded certificate (XF-Sup 95, SMQ $3,500). 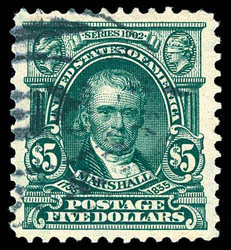 ONE OF THE FINEST USED EXAMPLES OF THE 1903 $5 MARSHALL HIGH VALUE. 1903, $5 dark green, neat unobtrusive registry oval cancel, beautifully centered with large evenly balanced margins, rich vibrant color, Extremely Fine to Superb, the P.F. has only graded two examples as such with none higher; with 2014 P.F. Graded certificate (XF-S 95, SSV $3,500). A WONDERFUL USED GEM EXAMPLE OF THE 1903 $5 MARSHALL HIGH VALUE - ONE OF THE FINEST EXAMPLES EXTANT. 1908, 5¢ blue, imperf, top margin single with part imprint, o.g., never hinged, exceptionally wide margins, wonderful rich bold color, Extremely Fine to Superb, a beautiful position single; with 2015 P.S.E. Graded certificate (XF-Sup 95, SMQ $900). 1908, 5¢ blue, imperf, centerline block of 4, o.g., never hinged, large margins, deep rich color and very fresh, small trivial natural gum wrinkle in bottom left stamp, Extremely Fine. Scott No. 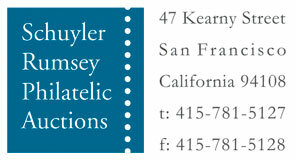 315; $9,000 for hinged Estimate $10,000 - 15,000. 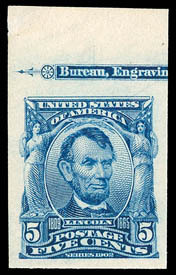 AN EXTREMELY RARE EXAMPLE OF THE 1908 5¢ IMPERFORATE ISSUE IN CENTERLINE BLOCK FORMAT - BELIEVED TO BE UNIQUE NEVER HINGED CONDITION. 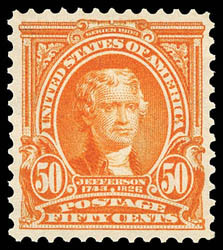 In Max Johl's work "United States Postage Stamps of the Twentieth Century" states that 29 sheets of 400 of the 1908 5¢ imperforate issue were issued with the majority used in the manufacturing of private coils. He also notes that not more than ten centerline blocks could exist. This concurs with our search, as we find that at least six different centerline blocks existing since the 1960's with this block being the only never hinged example. 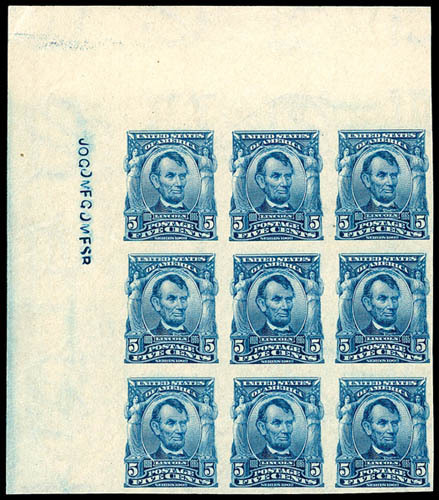 1908, 5¢ blue, imperf, corner margin block of 9 with siderographer's initials, o.g., never hinged, ample margins around and full sheet selvage, bold color, fresh and Extremely Fine, a very scarce large multiple, especially in never hinged condition; with 2015 P.F. certificate. Scott No. 315 $5,800 for n.h. pairs and single. 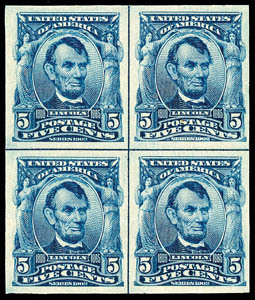 1908, 5¢ blue, imperf, right margin plate block of 6 with plate number "4073" and imprint, full o.g., large to huge margins with full sheet selvage, fresh with rich bold color, Extremely Fine; with 2015 P.F. certificate. 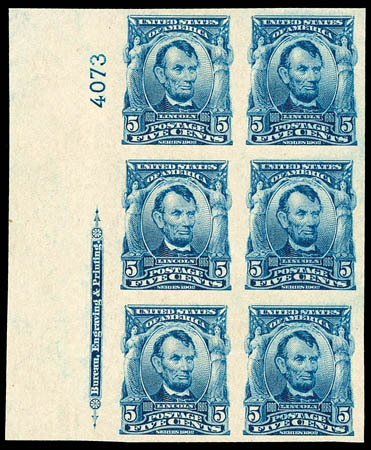 A CHOICE PLATE BLOCK OF THE 1908, 5¢ LINCOLN IMPERFORATE ISSUE.